For years, an invasive species lurked deep in Lake Mendota’s waters, eluding detection from University of Wisconsin-Madison researchers. When the spiny water flea was finally detected in 2009 during a routine teaching exercise, a limnology professor called the sample "spiny water flea applesauce" — trillions of the species were already in the lake. As the researchers dug a little deeper, they realized the spiny water flea had likely been there for as long as a decade before discovering it, said Jake Walsh, postdoctoral researcher at the UW-Madison Center for Limnology. "We were stumped," he said. "We were like, 'How is this possible? We have a crew out on Lake Mendota between a dozen and 15 times a year ... and we still missed it until it got to these really high densities.'" So in 2016, Walsh and a team of researchers set out to find out how researchers in one of the world’s most studied lakes could have missed the tiny, predatory zooplankton. What they found, which is detailed in a new study, is that their experience wasn’t an accident, it was the rule. 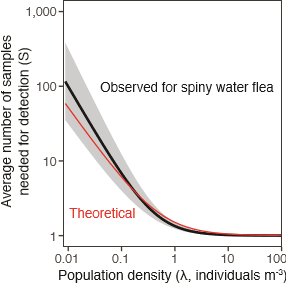 The spiny water flea avoided detection for years by living at lower numbers than sampling could account for, and it can be assumed that other invasive species do as well, said Walsh, lead author of the study. "We can't study what we can't find and we can't study them when they're at these really low densities," he said. "And so it might be really likely that we see this invasive species a lot more often than we think we do." Catching one spiny water flea in a cubic meter of water is equivalent to catching a sesame seed in 250 gallons of water, which means scientists need to develop tools to work smarter and increase detection probability, Walsh said. "Really figure out for each of the species you're surveying for, what is the optimal way to find them," he said. "That can really reduce your effort because as you get down to these really low densities, the amount of effort you have to put in to find them is just astronomical." For the spiny water flea that means using a larger zooplankton net (a cone-shaped net that filters the water to collect zooplankton) that is 1 meter wide, versus current standard nets that are about a foot in diameter. Spiny water fleas travel in swarms and can easily be swept in and out of sampling locations by wind and currents. They are also most plentiful in Lake Mendota in the fall. Walsh also points to a "promising" new technique using environmental DNA that looks for the DNA organisms leave behind, meaning scientists wouldn’t have to actually capture the organism to show it’s there. "It’s the forensic way to detect a species," he said. "It changes it from looking for that thing that's 1 centimeter long, to looking for the genetic DNA cloud that it sheds in an area, increasing our chances of finding spiny water flea." The spiny water flea is changing the foundation of Lake Mendota. It preys on the native zooplankton, Daphnia pulicaria, which keep algae levels in check and are an important food source for native fish. Since 2009, UW-Madison Limnology researchers estimate the zooplankton's numbers have dropped by about 90 percent and water clarity has declined by about 3 feet. And in return, the spiny water flea doesn't have a natural predator in the lake because their long tail and spines make them difficult to eat. Early detection is crucial because the window for taking preventive measures against invasive species is narrow, Walsh said. For the spiny water flea, it’s too late. "It advocates for this sort of cautionary principle of preventing invasive species spread," Walsh said. "Once they're in a lake, trying to get them out, trying to manage the population is really hard, and in the case of spiny water flea it's impossible." Lake Mendota is a hub for recreational boating, the key thing would have been preventing the spread to other lakes, which inevitably has happened, he said. "Unfortunately for spiny water flea, we can't actually control its populations, we don't have any techniques for that right now," Walsh said. "So as soon as we figured out it was here, we could have tried to really manage our boat launches and make sure people aren't moving water that could have spiny water flea in it to other lakes in the region."